'Pee on me' say these Trump statues; here's why! Advertising professional Phil Gable placed the statues on the streets. "This idea is a new, funny way to express the disgust that so many us feel," said Gable. 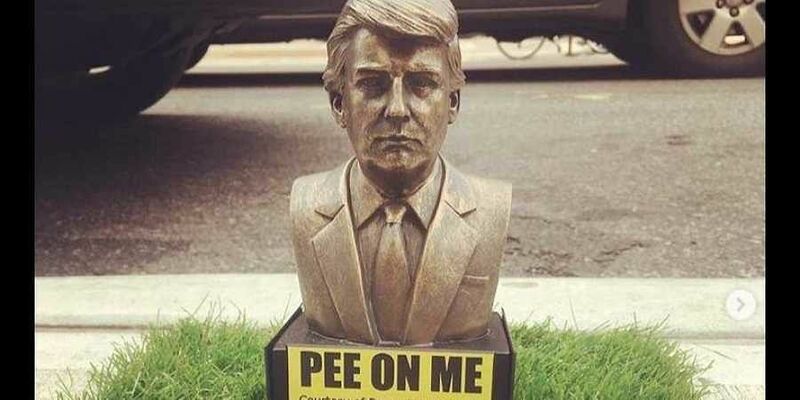 A number of small statues depicting US president Donald Trump (in the 1980s) with a small yellow sign on them reading 'Pee on me' have cropped up across Brooklyn sidewalks in New York. According to foreign media reports, advertising professional Phil Gable placed the statues on the streets over the weekend. The statues can be seen mounted on patches of grass on the sidewalks. Gable told MailOnline that his idea is "a new, funny way to express the disgust that so many us feel." "I wanted to see how people reacted, and the reaction has been really great so far - I mean really great, probably some of the greatest reactions anyone has ever had to anything ever," said Gable to Gothamist. He said that a woman and her two children came up to him as he was setting up one of the statues and thanked him, telling him that gestures like his makes her love Brooklyn, NBC4 new york reported. Although Gable says that he has received "great response so far" with the majority of people finding them funny, he noted that some have taken offense. “Some Democrats have been offended because they think it is distasteful, and a few Trump supporters felt it is disrespectful,” he told NBC New York. "Compared to what Trump has publicly said and done, and considering how mean-spirited he is, I think this project is pretty light-hearted,” he added.